Concrete Testing is needed in the case of new concrete to ensure that the material that was specified and bought is the same material delivered to the job site. 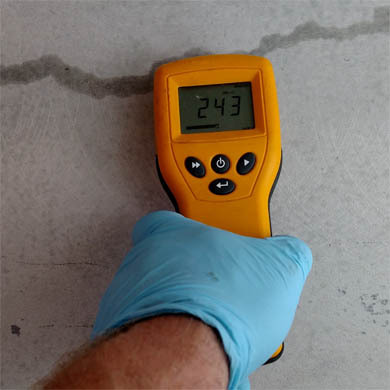 In the cast of existing concrete testing is needed to identify possible concrete defects that may effect the performance of the concrete and any coating or treatment using concrete as it's foundation. 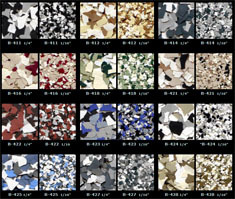 There are a dozen different test methods for freshly mixed concrete and at least another dozen tests for hardened concrete, not including test methods unique to organizations like the Army Corps of Engineers, the Federal Highway Administration, and state departments of transportation. Slump, air content, unit weight and compressive strength tests are the most common tests. 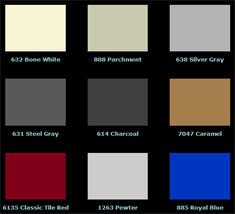 Slump is a measure of consistency, or relative ability of the concrete to flow. If the concrete can't flow because the consistency or slump is too low, there are potential problems with proper consolidation. If the concrete won't stop flowing because the slump is too high, there are potential problems with mortar loss through the formwork, excessive formwork pressures, finishing delays and segregation. Air content measures the total air content in a sample of fresh concrete, but does not indicate what the final in-place air content will be, because a certain amount of air is lost in transportation, consolidating, placement and finishing. Three field tests are widely specified: the pressure meter and volumetric method are ASTM standards and the Chance Indicator is an AASHTO procedure. Unit weight measures the weight of a known volume of fresh concrete. Compressive strength is tested by pouring cylinders of fresh concrete and measuring the force needed to break the concrete cylinders at proscribed intervals as they harden. According to Building Code Requirements for Reinforced Concrete (ACI 318), as long as no single test is more than 500 psi below the design strength and the average of three consecutive tests equals or exceed the design strength then the concrete is acceptable. If the strength tests don't meet these criteria, steps must be taken to raise the average. It is generally accepted that concrete should be allowed to cure a minimum of 28 days before traditional coating materials are applied to it, with the exception of cementitious coatings that water cure together with the concrete. This cure duration is based on the time it normally takes for the concrete to achieve sufficient physical strength to allow various trades to perform their work without damaging the concrete. Although it is a civil/structural requirement, the 28-day cure period has been generally accepted as a limiting factor for the coating of concrete as well. Even after the 28-day waiting period, moisture may still be present in the concrete. All initial water in the concrete mix may not have fully reacted, or the concrete may have absorbed additional water from rain or other sources. This water can migrate to the surface and affect the adhesion of coatings. 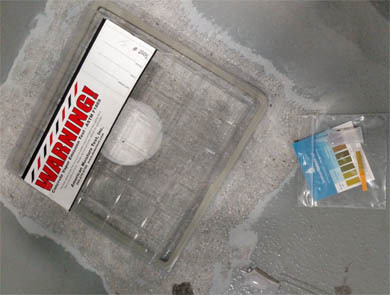 In concrete slabs in areas of high water tables and/or without the use of proper fill without a vapor barrier under the slab may allow moisture mitigation to the surface. In most applications this is either unnoticed or of minimal impact. If however a sealer, coating, or resurfacer is applied this may become an issue. In the United States, most floor coating manufacturers require concrete floors to reach a water vapor emission rate of either 3 or 5 pounds/1,000 square feet/24 hours before application as measured by calcium chloride tests before coating can commence. The time needed to reach the desired rate varies significantly, ranging from a few weeks to many months. 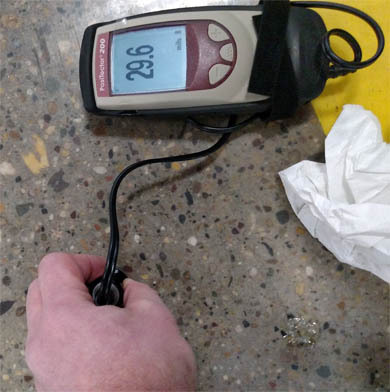 The use of a moisture meter with the use of two sharpened electrical probes that must be gouged into the surface can determine the percentage of moisture content in the surface based on the concrete’s ability to conduct electricity. Commonly referred to as the poor man’s moisture test the plastic sheet test is simply taping a 12”x12” inch section of plastic sheeting to the slab for 24 hours and visually checking for moisture. 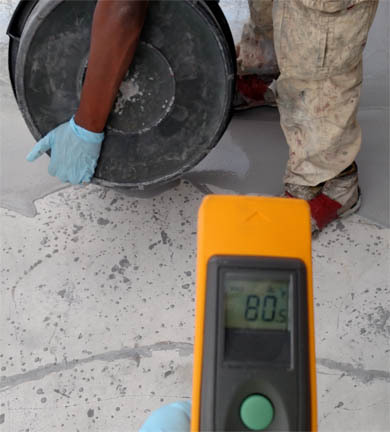 The most recent development and most accurate in determining relative humidity directly in concrete slabs is use of radio frequency. This is done both non-destructively and instantaneously.